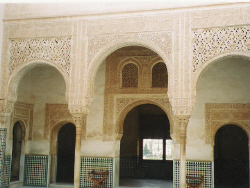 The Alhambra started off as a basic moorish fort or alcazaba in the 9th century but was completely transformed during the 13th and 14th centuries by the Nasrid dynasty rulers when they added lavish palaces and gardens adjoined by an enclosed town or medina. Although the buildings fell into disrepair during the 18th century they have now been extensively restored and it is possible to see much of the original intricate decoration of beautiful carvings and colourful ceramic tiles along with the very impressive water features within the tranquil courtyards and gardens. 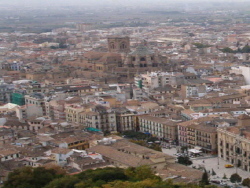 If you are visiting by car the signs directing you through the city to the Alhambra lead you to the official parking area, but if you are already in the city centre it is best to take the Alhambra bus from Plaza Nueva for the short but uphill journey, to save your feet for the visit. The site is large and you should allow at least 3 hours for your visit. We recommend that you make use of the excellent audio guides for hire at the ticket centre which explain what you are seeing as you go around. As visitor numbers are strictly restricted it is advisable to book ahead which you can do online on the Alhambra tickets website. Situated just off the Gran Via de Colon in the the centre of Granada the gothic/rennaissance cathedral dates from early in the 16th century, when it was built under the instruction of the Catholic Monarchs, in an attempt to emphasise their authority in the recently captured city. It contains some interesting statues and carvings, the highlight is the richly decorated Capilla Mayor. You can visit the cathedral Monday - Saturday 10.30-1.00 and 4.00-7.00(winter 3.30-6.30) for a small admission fee. Adjoining the cathedral on c/Officios the Royal Chapel or Capilla Real was built in the 16th century to house the bodies of the Catholic Monarchs. Inside the mausoleum you can see the tombs of Ferdinand and Isabel, along with those of their daughter Juana la Loca and her husband Felipe el Hermoso. In the sacristy there is a museum housing Isabel's personal art collection, which includes a painting by Botticelli, along with various other artifacts pertaining to the monarchs. Opening hours are the same as the cathedral.